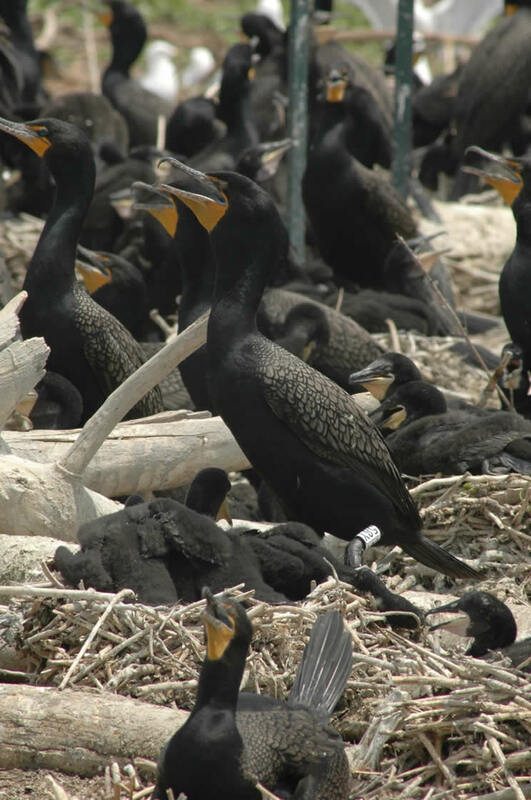 Beginning the middle of August and continuing into September, there were multiple reports of juvenile Double-crested Cormorants (DCCO) exhibiting neurological symptoms in Southwestern Ontario. The initial cases occurred in the Toronto area along the shore of Lake Ontario, but additional cases were submitted from the shores of Lake Erie (a couple of weeks after the Toronto cases were submitted). Based on the symptoms and the species affected, we were highly suspicious that these birds were infected with avian paramyxovirus subtype 1 (APMV-1); however, West Nile virus (WNV) infection had to be ruled out due to the detection of the virus from a DCCO last summer in Ontario. Microscopic lesions in the brain were consistent with an underlying viral infection so based on these findings, fresh brain tissue was submitted for PCR testing and all DCCOs submitted for testing were found to be positive for APMV-1 and negative for WNV. Additionally, 11 DCCOs submitted from Toronto and other regions of SW Ontario were also positive, bringing the total to 16 cases submitted to CWHC during this two-week period (Figure 1). At the same time as the outbreak in Ontario, multiple DCCOs in the Maritimes were presenting with similar clinical signs. As with the DCCOs in Ontario, microscopic findings were suggestive of an underlying viral infection and multiple tissues tested by PCR were positive for APMV-1. A total of 8 DCCOs (6 from Prince Edward Island and 2 from Nova Scotia) were submitted from this region (Figure 1). APMV-1 is the causative agent for Newcastle disease in chickens and although most paramyxoviruses affecting DCCOs are not highly pathogenic to poultry, the viruses involved in these cases do appear to be consistent with velogenic strains, which tend to be highly pathogenic to poultry. Infection with this virus causes severe disease and often death in juvenile DCCOs (typically 5-8 weeks of age). Adult DCCOs do not appear to be susceptible to disease from the virus and may act as a natural reservoir. Outbreaks of APMV-1 in DCCOs occur occasionally on the Great Lakes and throughout other regions in Canada (from Alberta to the Maritimes). In DCCOs, the virus typically affects the brain resulting in severe neurological disease, including paralysis, and eventually death. Rarely, other species are affected by the virus during these outbreaks in DCCOs, but there was no evidence of the virus affecting other species during this recent outbreak. Figure 1: Map showing the distribution of APMV-1 cases detected in double-crested cormorants in Ontario and the Maritimes in 2018. Lower left inset: Distribution of APMV-1 cases in Ontario. Lower right inset: Distribution of APMV-1 cases on Prince Edward Island.